Do you help kids on math at home? Today I have a free app that is a great math teaching/learning tool. 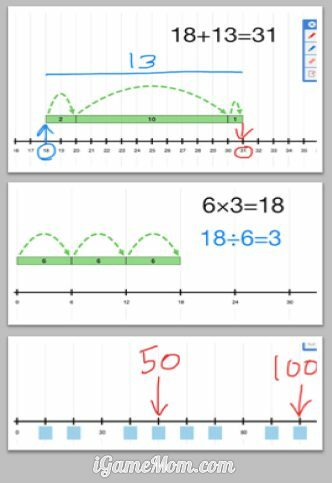 Number Line is a simple app, yet you can use it for so many different math problems: addition, subtraction, multiplication, division, skip counting, number patterns, and more. It helps kids visualize number sequences and model strategies to help kids understand the math concepts intuitively. The basic idea of the app is very simple. It is a line that you can put different numbers along the line. However, the developer added many features so that the app becomes a very versatile teaching tool. For simple addition, say 3+5, you can tap on the keypad button – it is the one with the 4 math operation symbols next to the little pencil button, enter the equation. Then you can tap on the Jump button – the one with dotted dumping arrow. You will see a forward jump of 5 units shown up on the main screen area. You move that jump units to align to the number 3 on the left, kids will see the jump stops at 8 on the number line. You can do a backward jump for subtraction, and repetitive units for multiplication and division. If you hide the numbers under the line except a couple, you have a skip pattern set up. You can choose different unit size. By default, it is 1 per unit. You can set it 3, 4, 10, or any number for a unit. This makes the app a good skip counting tool. By choosing to hide all numbers below the line, you can even create a quiz for the kids. There is a good instruction on how to use the app in the help section. You can access the help section by tap on the little question mark on the lower left corner of the screen. 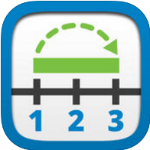 Overall Number Lines is a very easy to use app that helps kids gain visual understanding of numbers and math operations. It is available on iPad. It is FREE on App Store.